Catherine McCord launched Weelicious in 2007, providing a solution to parents' hectic lives by showing them how to cook recipes that are kid-friendly, quick and nutritious. With a background in culinary arts from New York City's prestigious Institute of Culinary Education, and a passion for food, Catherine has developed recipes that appeal to a range of ages. Weelicious focuses on educating kids and involving them in the process with how-to cooking videos featuring Catherine's own two children. I'm a total sucker for holidays. I love decorating, baking, and doing things as a family that reflect the happy spirit of whatever the holiday is for. Valentine's Day always was THE Hallmark holiday to me, but now that I have kids, I have a whole new perspective on it and it's even more fun celebrating love. I've made more cookies and cakes over the years then I can count, so this year I wanted to do something a little different. Ruby-red blood oranges are in season, so I thought that it would be fun to come up with a recipe for them. Granitas are like shaved ice or snow cones, except these aren't made with sugary corn syrup. Instead, they use the sweet juice of the blood oranges and just a touch of agave. Just the right amount of sweetness for everyone! 4 Cups Blood Orange Juice, reserve several of the orange peel "shells" for serving. 1. Combine the blood orange juice and agave in a 8x8 inch Pyrex dish and whisk to combine. 2. Place in the freezer for 1 hour. 3. Remove from the freezer and scrape with a fork to break up pieces. 4. Place back in freezer for 1 hour. 5. Remove from the freezer and scrape with a fork to break up pieces. 6. 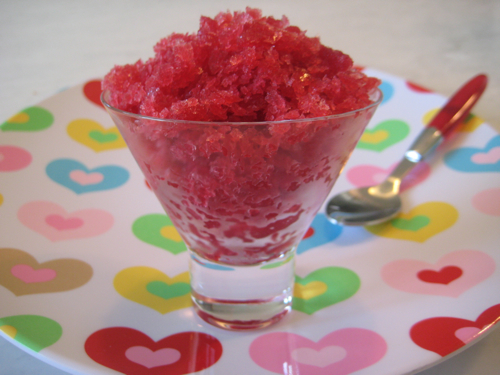 Repeat this process over several hours until granita is similar to shaved ice. 7. Serve in orange peel "shells" or in bowls (cover the pan with tin foil to keep in the freezer). Catherine McCord launched Weelicious in 2007, providing a solution to parents' hectic lives by showing them how to cook recipes that are kid-friendly, quick and nutritious.